I can hear my mother’s voice in my head as I type right now. Ohhhhh, Jen… What are you thinking? You have your hands full already! I’m worried about you, what are you going to do with another one! Sorry Mom. I love you, but what can I say… if it’s meant to be, it’s meant to be. This lucky fellow, was discovered in our neighbors back yard this afternoon and together we’re all working to find his owners. His tags have a phone number which we hope will not sadly led to a dead-end. Tomorrow we’ll check in at our Vet to see if we can do more to find his rightful owner. He’s a sweet little guy. Submissive, playful, maybe a little on the thin side – but I’m accustom to looking at two large labs, appears to be healthy, well-behaved, happy and thankfully house trained. As loving dogs owners ourselves, who at one point had four dogs, we can’t imagine what it’s like to have a family dog lost. What must be going through these owners minds as they run through all the horrid possibilities of where he is and what has happened to him is an anguish we simply can’t even begin to imagine. We also recognize there is the realistic possibility he may have simply been abandoned. As sad, pathetic and irresponsible as that may be, we do realize that it’s a strong possibility that is how he came to be wandering into our lives. I want to believe he’ll find his home and be reconnected again with whoever is family is, we’re not naive enough not to acknowledge the dark side of how people treat animals. I hope we’re wrong. While it was our wonderful neighbors who initially took Ace in today, we’re the ones with a fenced yard, dog food, leashes and are equipped and prepared for living with dogs, so we’ve happily taken him in while actively searching for his owners. Thus far, our pack of two labs has welcomed the little fellow into their pack with nary a blink. With tails waging, lots of running around playing in the yard and acting as if they’ve been together for a lifetime, all three are laying at my feet fast asleep snoring as I type. If it’s meant to be, it’s meant to be. If we can’t get him back to his home, Paul and I already agreed that he’s found a home with us. While Paul and I have been struggling to find the right name for our baby girl arriving in a mere 16 weeks, it took all of about 2 minutes to decide that we’ll call him Lucky if he stays with us. The name seemed fitting and perfect don’t you think? So, for however long you’re with us, welcome to our growing family Lucky. What a lucky dog to have found the perfect loving family! He’s too cute! 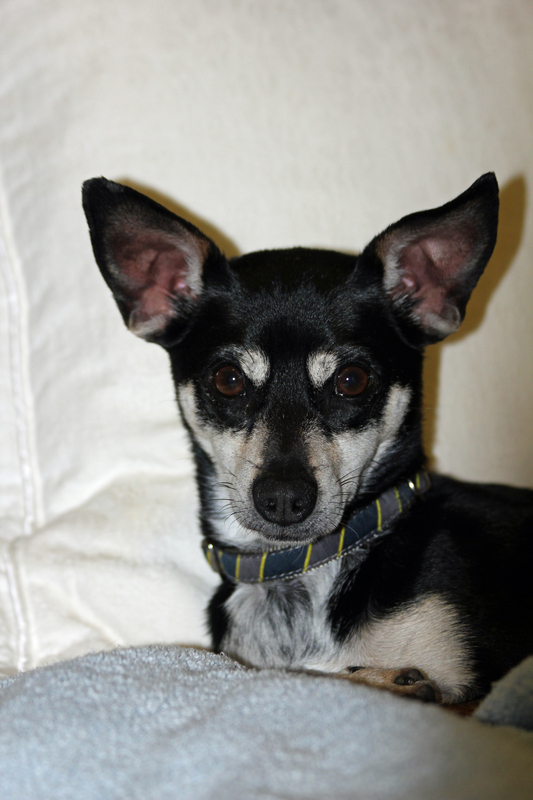 He is a very “Lucky” dog to be a part of your family! I just have one word for you “Georgia”:) miss you!